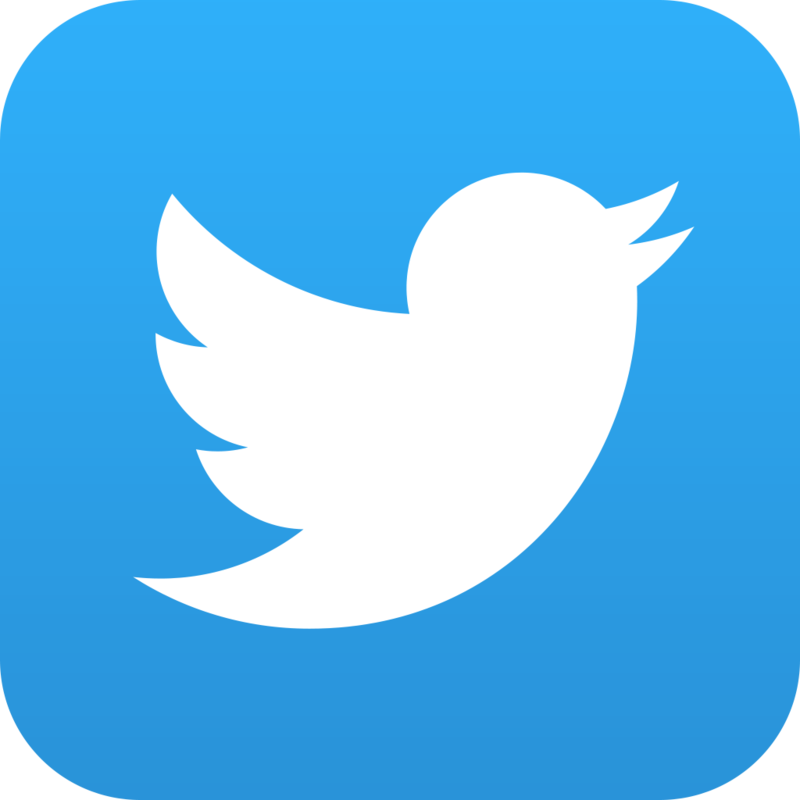 According to a 2014 study, Twitter has at least 645,750,000 active registered users. 135,000 new Twitter users sign up every day, and 190 million unique users visit the site every month. These impressive numbers speak for themselves. People are using Twitter. A lot of people are using Twitter, and it’s time for your business to take advantage of those numbers. But this article is going to get a little more specific. This one is for bars, restaurants and clothing stores; particularly local places that want to expand their reach and make the most of their Twitter accounts. Quick: Name your favorite bar’s Twitter account! Ok, how about your favorite local restaurant’s account name? No, me either. Truthfully, I can’t think of even one Twitter account for any of my favorite local places with the exception of a few active coffee shop accounts, and I can promise you that I’m active enough on Twitter that I would follow the hell out of more local business accounts if they were at all well known. If you were able to think of a local company’s account, you’re probably in the minority. Local businesses simply don’t seem to be making the most of what social media has to offer them. Thankfully, it isn’t hard to set up a Twitter account, gain a following and get the ball rolling. If you still aren’t totally convinced that your local business desperately needs a functioning Twitter account, here are a few more reasons. Twitter is cheap. – Actually, Twitter is more than cheap; it’s free. You can make an account, promote your business and gain a respectable following for the low price of absolutely nothing. And if you do have a few bucks to spare, you can invest in a promoted tweet or a series of promoted tweets. The cost is low and the visibility has the potential to be incredibly high. It’s worth the time and money to reach even a small portion of Twitter’s massive user base. Twitter can bring you new customers: With such a large user base, you’re pretty much guaranteed to reach at least a few people who have never come into your business before. With an impressive Twitter account, you’re likely to draw future customers in. I’ve visited countless restaurants and coffee shops after seeing one of my friends tweet about a great meal or drink he or she had. Twitter can strengthen business relationships with old customers: Twitter can allow you to reach out to brand new customers, but it can also help you establish stronger ties with your regulars. Stronger ties mean that these customers will keep coming back, and they’ll be far more likely to encourage friends to visit your business. It’s all a beautiful full circle that will lead to your business growing. Twitter can help you gain feedback: By having a place where customers can easily and quickly share their opinions, you can learn a lot about what your company is doing right or wrong. If you’re having doubts about a certain meal or a drink on the menu, ask your follows exactly how they feel about it. If you have a large, opinionated enough group, you’ll probably figure out just whether or not you should keep the item on the menu, change it up some or scrap it completely. Twitter also provides the option for you to easily address customer’s problems, highlight positive experiences and clear up any possible confusion. Twitter can build your business a reputation: If you build a strong enough Twitter profile, you can bring people into your store based on that account alone. If you’re particularly helpful, kind, funny or entertaining, odds are people are going to want to visit your business. For a local business, Twitter could be the easiest way in the world to reach a wider audience, but you have to take the time and effort to set up an account and use it regularly first. Once you’ve established yourself as a reliable account that’s worthy of followers, here are more specific things you can try, depending on your type of business. – Post appealing photographs of food to accompany tweets. Make sure the food actually looks good. Consider even hiring a photographer to take some savory photos. Consider taking photos of your daily menu. Let potential customers see exactly what their options will be when they walk in your restaurant’s door. – Encourage customers to post personal photos from their time in the restaurant. Have waiters mention the Twitter account. With permission, take and post photos of customers enjoying their meals. I know several local restaurants with photos of happy customers hanging on their walls, and it adds a feeling of comfort and hominess that would be hard to replicate. Create that same feeling on your company’s Twitter account. – Offer a discount, coupon or just a word of thanks to those who share their experiences with the world. – Promote a deal of the day. Use Twitter to share special menu changes and deals. Let followers know about your best options. – Post photos of drinks and descriptions on Twitter. Get creative. Post drinks that are specific to your bar, drinks that customers will want so much that they’ll come to your business. – Share quick and easy drink recipes through tweets. You’ll probably get a lot of retweets, which will introduce your bar to more potential customers. – Post photos from inside the bar. Share your atmosphere with the world. Let people know how your bar looks and how it sounds. Those who enjoy the setting will be very likely to check it out in person. – Encourage an original hashtag to be used for your bar. If it catches on, you can use that hashtag not only for promotion, but also to see just what people are saying about your bar. You can keep a close watch on your company’s online reputation. – Promote a drink of the day, complete with a coupon that can be used by showing the bartender a screenshot of the tweet. – Have a bartender announce that the person to get the most retweets on a tweet promoting the bar gets a free drink. Anything that gets your company’s name out to the public is worth trying at least once. – Post photos of new clothing shipments. Let customers know what you have and how much you have of it. If stock in a particularly popular dress is dwindling, encourage customers to get one while they have the chance. – Consider a hashtag discount for a day. If customers come to the store, tweet while they’re there and use your store’s hashtag, they get a coupon for a purchase. It’s a good way to spread the word about your business, have some fun and make sure that existing customers keep coming back. – Post “outfit of the day” photos. Highlight a specific stylish outfit that your store is selling every day. Put it in the front of your store. Make it easy to find and let all of Twitter know that it’s available and in high demand. – Post style tips. If your followers are following a clothing store, they would probably appreciate — and be eager to share — fashion-forward style tips with all of their friends and followers. When used correctly, Twitter can be the cheapest, simplest way for businesses, particularly local business, to strengthen their brand and draw in new customers. By following the tips I provided and brainstorming some of your own, you’ll likely gain a following in no time. Also consider setting up a Facebook, a Google Plus and any other social media account that you can for your company. The more people you reach, the better for your business. Remember, no matter what account you’re posting from, engage, engage, engage with your followers. Calmly and kindly address negative responses without blaming the customer. Graciously thank those who spread positive words about your company. Make everyone who takes the time to tweet to your business feel important and cared about on a personal level. And offer people something they might not have seen before. Be creative with your tweets. Offer fun deals, contests and giveaways and information that potential customers could find relevant, entertaining and useful. If you would like to reach me for further questions or discussion, you can email me at schylermartin@gmail.com or reach me on Twitter @SkyyTweet. When looking at bars in the local area most will search for the largest town near them. Although Chapel Hill, Durham, Greensboro and other surrounding areas might have an amazing bar scene it is important for bars throughout the Triangle to recognize that most people coming to the area or new to the area will automatically search for Raleigh when it comes to a nightlife or downtown scene. That said, there are still some interesting cases of bars and restaurants using Twitter in the town of Chapel Hill. Chapel Hill is about 26 miles from Raleigh so if the bar scene or downtown scene is good enough people will be willing to make the drive. Even though a cab ride might get expensive it is possible to find a driver or even look at other options to get from Raleigh to Chapel Hill. A very interesting case study in Chapel Hill is Top of the Hill. This has been one of the places to be seen in the Triangle area. Almost all UNC students make their way to Top of the Hill at one point or another during their undergraduate or graduate years. After turning 21 it is a tradition for students to head up the steps to Top of the Hill to start their 21st year the right way. 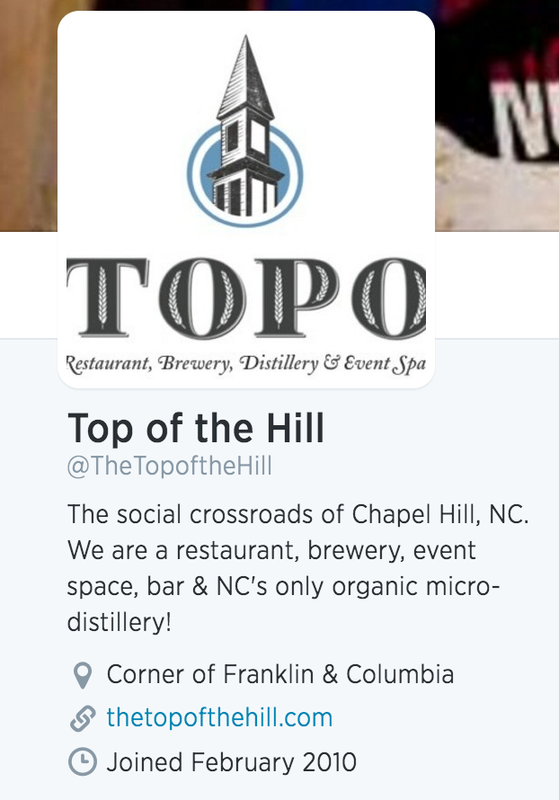 Although Top of the Hill is the most popular bar in Chapel Hill they recognize that a social media presence will only help their brand. They have a very active Twitter account that actually retweets many of those that mention them. This happens quite a bit if you mention Top of the Hill while you are eating or at the bar. This is something I think more bars and restaurants should do. At this point, Top of the Hill is approaching 4,000 Twitter followers which is many more than any of the other locally owned restaurants and bars. In fact, some of the other establishments on Franklin Street and in Carrboro only have a couple hundred followers. It is truly shocking to me that BSkis or Wings Over Chapel Hill do not have in excess of 1,000 followers. On any given week they service thousands of customers yet they cannot be interesting enough to break 1,000 followers. Another thing going for Top of the Hill is that everyone knows of the place and wants to go there. When Kentucky basketball came to play UNC in Chapel Hill in December of 2013 all of the Kentucky fans were told to go to Top of the Hill. I actually made my way over to Top of the Hill before the tip of the game and it was shocking how many members of the Big Blue Nation were at TOPO before the Tar Heels and the Wldcats tipped. As Top of the Hill continues to grow their Twitter presence and mention more patrons it will be interesting to see if this generates traffic to their website. Over the course of the last few months I have noticed that many people can get retweets and favorites but it can be difficult to get people off Twitter and onto a website.